POW Kolkata: Hand imprint activity. From her hand imprint Ruth fashions a peacock dancing in the rain....it was most beautiful to see the unfettered imagination of the children! 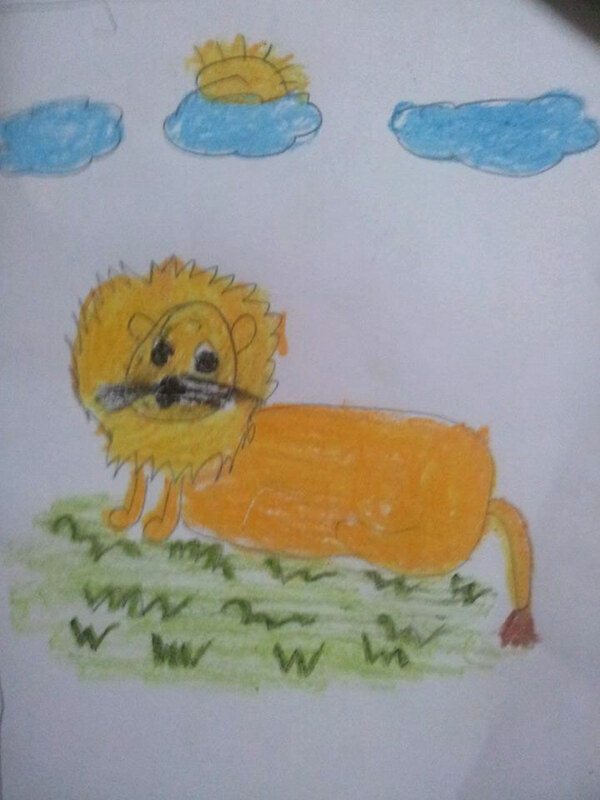 From POW Kolkata: When the children were asked to draw their favourite animals on a card Barsha drew a lion. She's addressed the card to her mother who is no more with a message that she loves her. She believes the lion will protect her and eat away people who tease or beat her. When I asked her 'who beats you? ', she replied 'my father'. 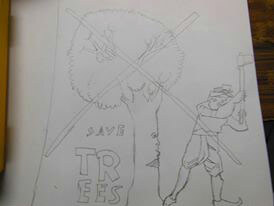 Manish from POW Delhi draws a world he would like to see - one in which humans show compassion towards trees. By Amrin, aged 4. 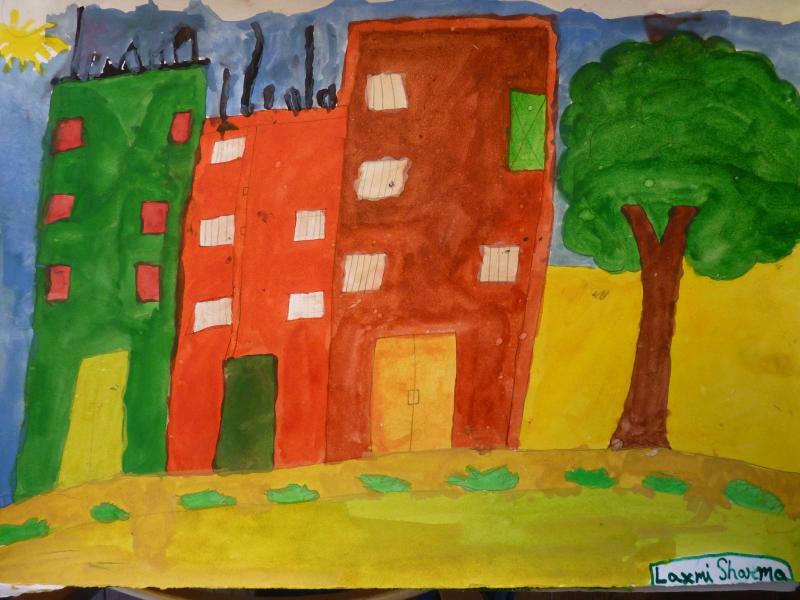 She says: This is the kind of house I would like all of us to live in - yellow and green and orange - they are my favourite colours. There would be a tree near the house, a well to draw water from and space for birds and bees. And lots and lots of space for the sky! 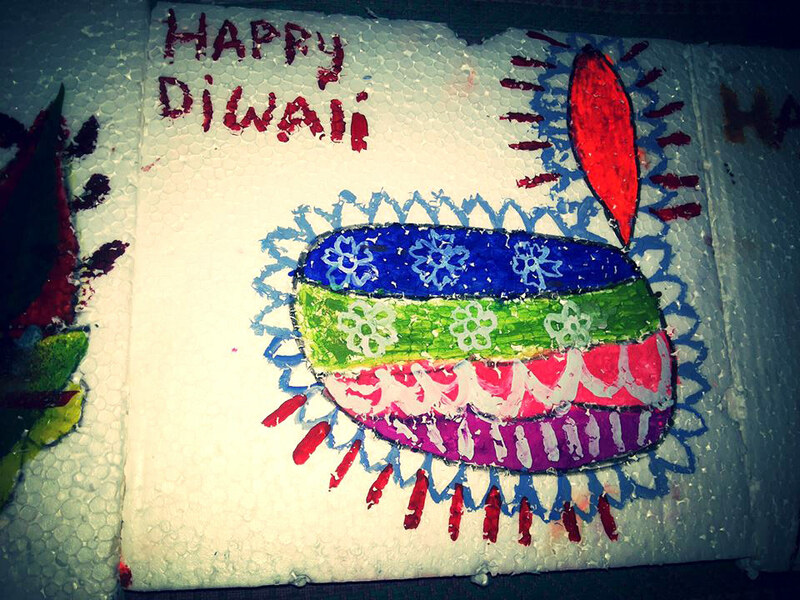 By Laxmi, aged 7. 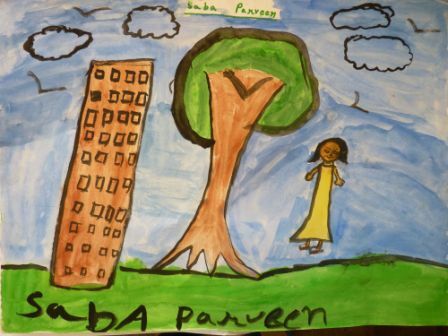 She says: Kolkata has many large buildings but I would love to see trees near the buildings too. And a sun above the buildings and space to play around the trees. By Naime, aged 7. She says: I see flags on lots of cars. 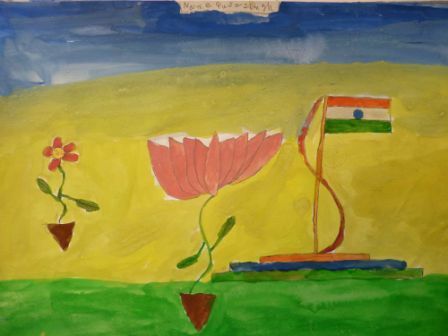 But my [Indian] flag is big and in a large ground with pretty flowers like the lotus, and grass, lots of sunshine and blue sky. 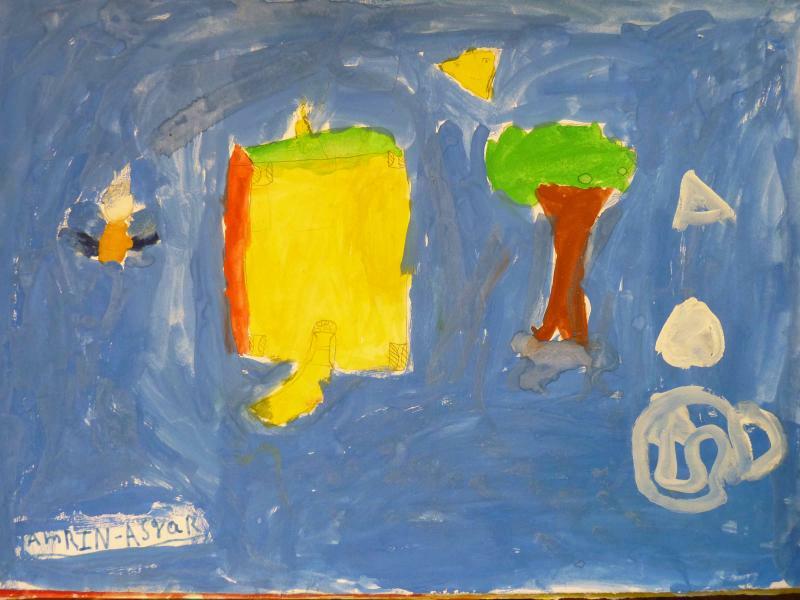 By Taufaz, aged 7. 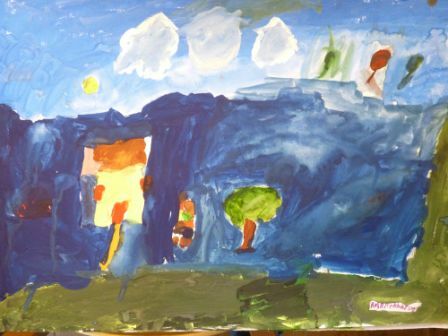 He says: In my painting there's a house and lots of different types of trees. But I've drawn only one car and a small one and it's far from the house because in Kolkata they are too many cars and not so many trees. It is dangerous for us to have so many cars on the road - we can get hit by them. It is better to have more trees. 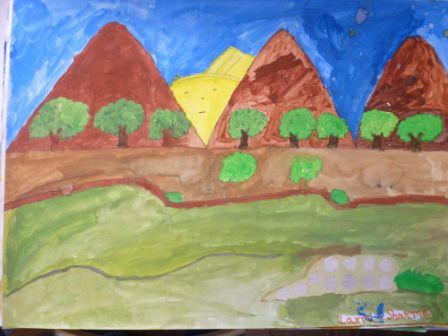 By Saba, aged 8. 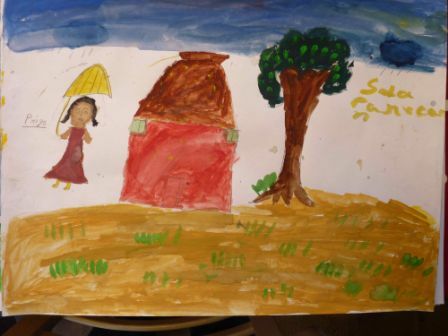 She says: I've drawn the house I would like Priya didi to live in. I would like her to have a big, special house because she's very special to us. And her house would be surrounded by all the nice things - grass, trees and sky. And because it's now the rainy season I've also drawn an umbrella for Priya didi so she doesn't get wet when she leaves her nice house. By Naime, aged 7. 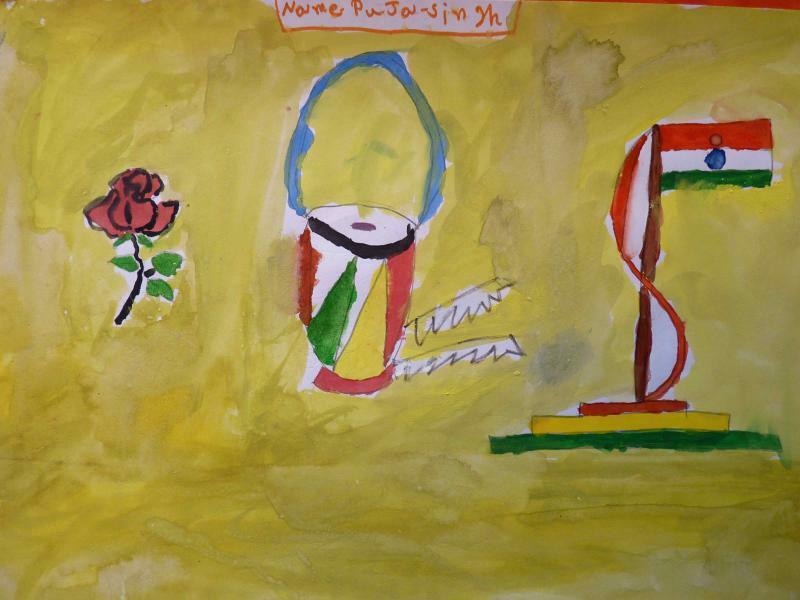 She says: For my second painting I have drawn another flag but with another flower this time, the rose. I have also painted a tabla. I wish my tabla could come alive because the colours of my tabla are 'happy' and it would make me really happy if I could play the tabla. 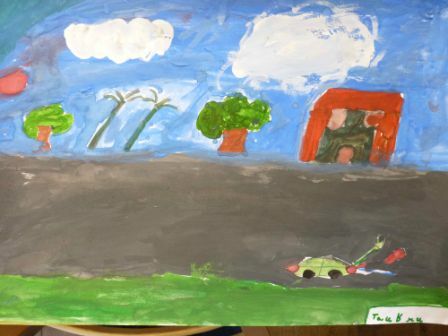 By Irfat, aged 8. 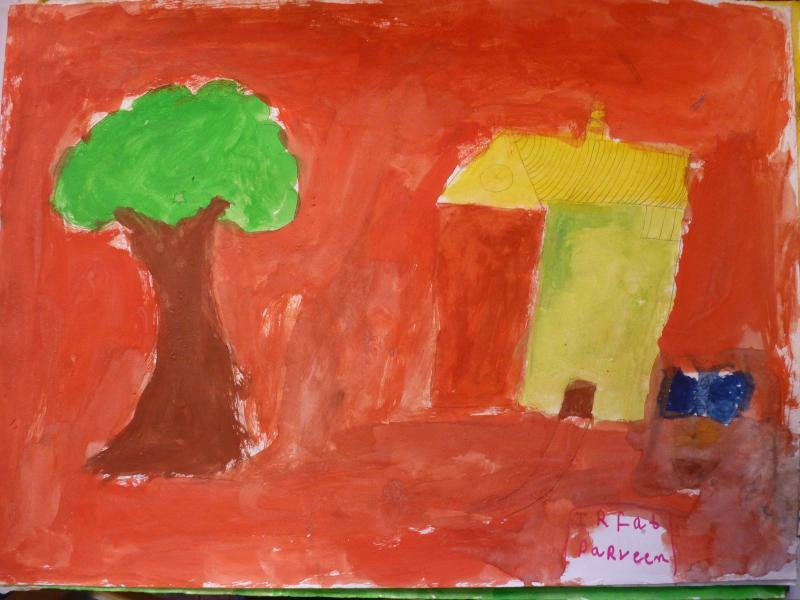 She says: I've painted a blue butterfly, a big house and an even bigger tree. I think trees are prettier than houses. By Amrita, aged 6. She says: I've painted a storm. The house, tree, animal, road leading to the house - all are in the midst of a storm. But the sky is not in the midst of this storm because it has a shining sun and white clouds. By Priety, aged 6. 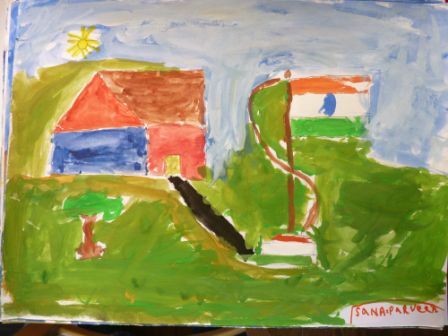 She says: In my painting there's everything - a big house, buildings which are crowded with lots of people, the Indian flag and trees. By Simran, aged 3. 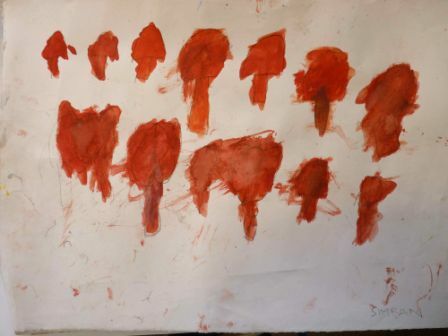 She says: I've painted my favourite orange ice-creams - one for everyone in the class! By Saba, aged 6. 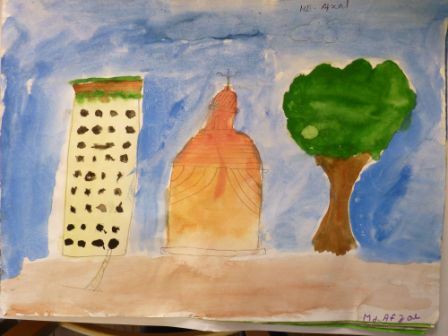 She says: My painting has a big building. When I look at the tall buildings all over I see they have so many windows - may be lots of people live inside. The clouds I've made are like those that appear in the rainy season in Kolkata when the birds all run here and there in the sky before the rain falls. I've made a big tree with Priya didi beside it. But in my picture Priya didi's hair is like mine! By Taffiaus, aged 7. 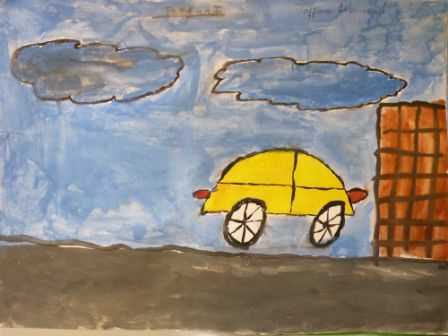 He says: I've designed a car for my painting. It's a car that I don't see on the roads but it's in my mind. The highlight of my painting is my dream car - it's small but it's enough and has a beautiful colour. The rest of the painting I've completed in a way to highlight the colour and design of my car. 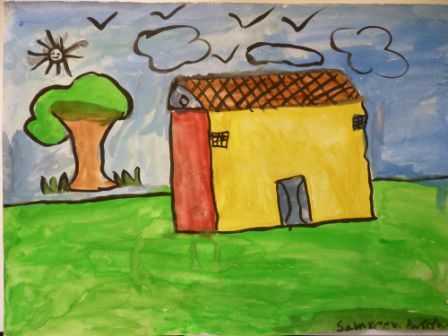 By Sana, aged 8. She says: My picture has the country's flag. There is grass all around the flag and the house and lots of space to play. I've made a road from the house going straight to the flag which is taller than I am. By Sonal, aged 7. She says: I have drawn a big house for Priya didi. I have made a special design on the main door and windows of Priya didi's house. I don't know if Priya didi likes flags but I drew my best one for her. I've painted lots of grass and sky because I like them. 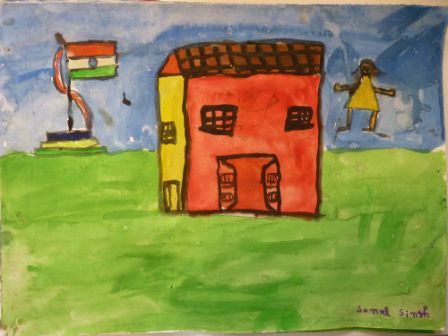 By Laxmi, aged 7. She says: I've never been to a hilly area but would love to go. In this painting I imagine how beautiful the hills must be and because they are so beautiful to be in such an area even the sun is happy! By Samreen, aged 8. She says: I've drawn my dream house. It has the most beautiful colours that are in contrast to the colours of the grass and the sky. It's a really big house like I saw in a film once and you can see the sun, clouds and birds if you live in that house. 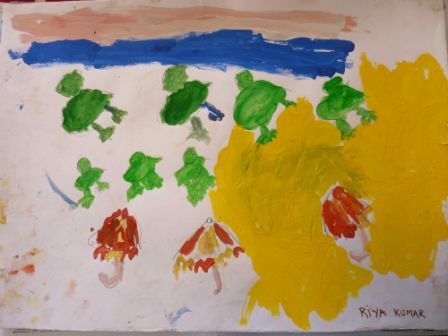 By Riya, aged 3. 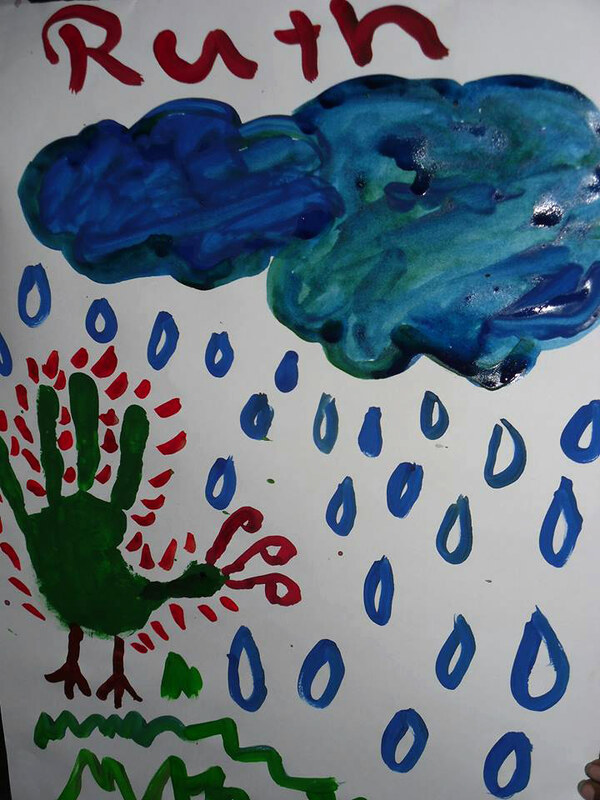 She says: I've drawn lots of green birds and umbrellas for them because I don't think they have any way to protect themselves from the rain. And because they fly high up in the sky they must get more wet than us who are more far away from the sky. 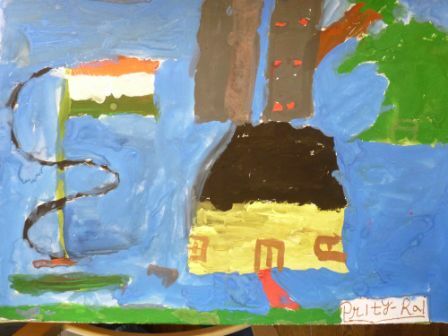 By Afzal, aged 9. He says: I love drawing and colouring. I like to draw many different things. Here I've drawn the Victoria Memorial because when Priya didi took us there I thought it was a very beautiful building. On one side of the building I could see the big buildings but on the other sides there were trees.